HOSPEEM is an official campaign partner of the Managing stress and psychological risks at work – Healthy Workplaces Campaign 2014-2015 of the European Agency for Safety and Health at Work (EU-OSHA). The Europe-wide campaign aims to raise awareness of the problem and show employers and workers that stress and psychosocial risks can be successfully managed and prevented. “Promoting occupational safety and health is a major priority for HOSPEEM, a priority that is even reflected in our 2014-2016 work programme. HOSPEEM is therefore strongly committed to making the Healthy Workplaces campaign a success. Together with the European Federation of Public Service Unions (EPSU), HOSPEEM is currently running a joint EU project aiming to assess the impact in the hospital sector of health and safety hazards, giving special attention to psychosocial risks and stress at work. Being the second most frequently reported occupational hazard across the EU, psychosocial risks and stress at work negatively impact the health and well-being of workers and healthcare institutions. Ensuring safer and healthier working conditions is therefore a major challenge for the healthcare sector. For HOSPEEM, the Healthy Workplaces Manage Stress campaign is an opportunity to exchange information and knowledge and to identify existing good practice in this field.” says Tjitte Alkema, Secretary General of the European Hospital and Healthcare Employers’ Association (HOSPEEM). How to get involved? There are a number of activities and events, find out more information on the Healthy Workplaces Campaign website. For you can watch the “Healthy Workplaces Manage Stress” video or find useful tools and resources. 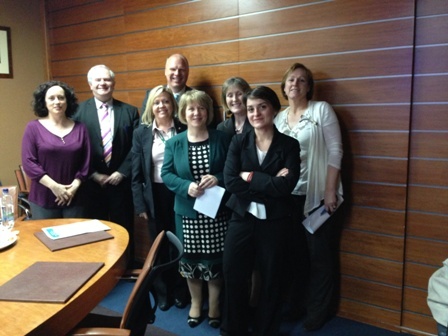 Following the study visit to members’ organizations in the Baltic States, on 17 April 2014 HOSPEEM visited its Irish member, the Irish Health Service – HSE. During a meeting at the Irish Department of Health, the ongoing reform of the Irish health system was discussed. A deep reform of the system which is based on the 4 key interdependent pillars of health and wellbeing, service reform, structural reform and financial reform and that will change many aspects of the health service leading Ireland to a single-tier health service, supported by Universal Health Insurance (UHI) foreseen to be adopted in 2016. At the HSE Corporate Employee Relations Services, Mr John Delamere, head of the Corporate Employee Relations (CERS) and representative of HSE within HOSPEEM, and the managers of CERS discussed with HOSPEEM their respective priorities. The focus was put in particular on the areas of common interest in the industrial relations and occupational health and safety fields, where CERS and HOSPEEM are closely working together and will further strengthen their cooperation. The day was concluded by a visit to the Beaumont Hospital, one of the largest hospitals in Ireland with 3,500 employees, 800 beds, with specialisation in neurosurgery, renal medicine and cancer care. HOSPEEM had the opportunity to meet the managing board of the hospital and to appreciate how, even when financial resources are limited innovative management measures and good cooperation with staff can help to maintain high standards of service delivered to patients. HOSPEEM thanks John Delamere, Norah Mason and HSE CERS, as well as the Beaumont Hospital for the warm welcome and the fruitful exchange. On 31 May 2013, the European Commission launched a public consultation further to results of the evaluation of the European Strategy on Safety and Health at Work 2007-2012. This was aimed at gathering contributions from the public for the new EU policy framework. Welcoming this initiative, HOSPEEM and EPSU responded to the consultation (see HOSPEEM response). At the Plenary meeting of the sectoral social dialogue for the hospital sector held on 11 December 2013 HOSPEEM and EPSU approved a joint statement. With this document, HOSPEEM and EPSU aim to highlight common priorities and views for the new EU policy framework on occupational safety and health at work. HOSPEEM has replied to the public consultation launched by the European Commission further to the results of the evaluation of the European Strategy on Safety and Health at Work 2007-2012 (http://ec.europa.eu/social/main.jsp?langId=en&catId=699&consultId=13&furtherConsult=yes). The aim of the consultation is to identify current and future challenges in the occupational safety and health area and instruments to tackle these challenges. In its reply HOSPEEM supported the approach to define common general objectives for the future health and safety policies at European level. However, the organisation stated that actions in this field have to be targeted on each national situation, legislation, organisation and practice. HOSPEEM emphasised also the importance of social partners’ involvement in the future health and safety-related initiatives.